Why have one bag when you can have two? 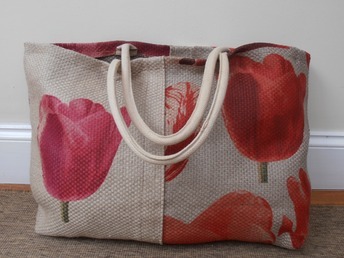 Simply turn the reversible bag inside out and you have another style to enjoy. 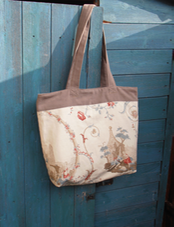 This one is made of moleskin, velvet and toile de jouy. The bags can easily be personalised: one of my clients is a gardener who loves chocolate and velvet, so her bag was made from chocolate linen with faux leather leaves and a velvet interior. 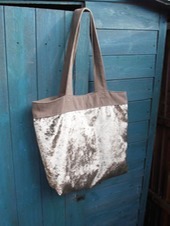 I also make non-reversible bags. Here's one made from tough linen. 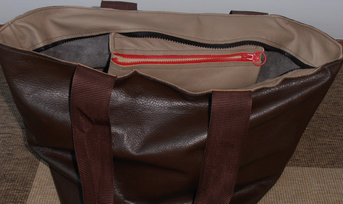 And here's another made from leather with a zipped inner pocket.